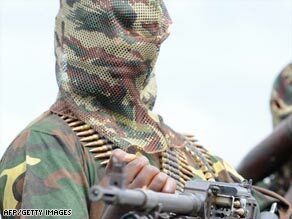 LAGOS, Nigeria (CNN) -- Fighting erupted Wednesday between Nigerian soldiers and armed militants in the country's oil-rich southern Niger Delta, both sides said. Militants from the Movement for the Emancipation of Niger have attacked soldiers escorting oil workers. Militants belonging to the Movement for the Emancipation of the Niger Delta ambushed a military unit escorting Chevron workers at an oil terminal, injuring two soldiers, said military spokesman Col. Rabe Abubakar. The militant group, however, issued a statement saying the Nigerian armed forces launched an unprovoked attack on its camps. It issued a warning to oil companies in the region to evacuate their staff to avoid escalating violence. The movement said it had sunk two Army gunboats and inflicted several army casualties. Abubakar, however, said, "There is no truth to what the militants are saying." The militants said the fighting continued to rage, while the army said it had stopped. Violence has limited shipment of crude oil supplies out of Nigeria, Africa's largest producer. Militant fighters have attacked pipelines in retaliation against government forces. The movement demands that more of the country's oil wealth be reinvested in the region instead of enriching foreign investors. It also demands the release of prisoners it believes are being held for political reasons. In the past, militants have taken American and European oil workers as hostages. A sick British oil worker, held for seven months, was released a month ago.